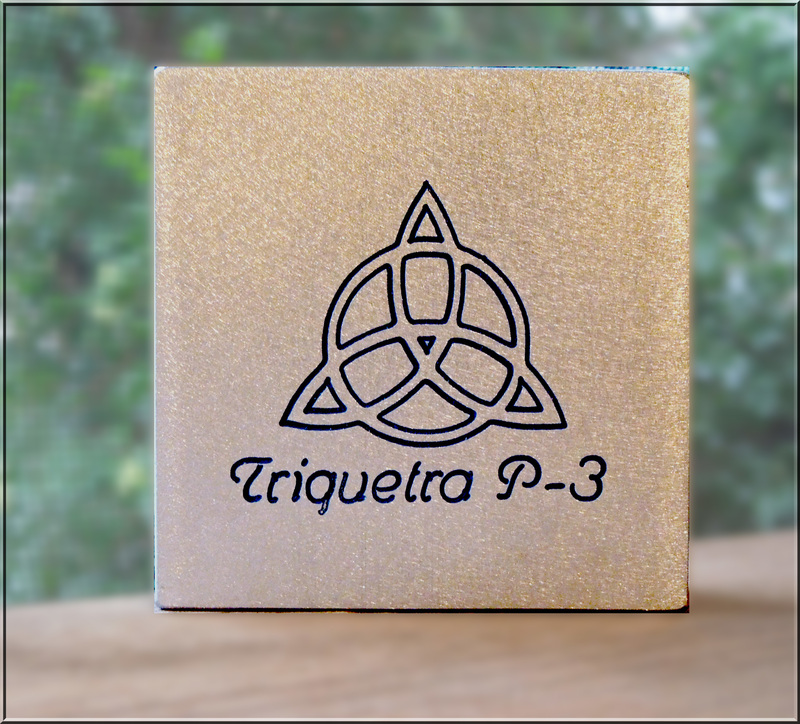 Triquetra Touch Plate Kit 30% Off! 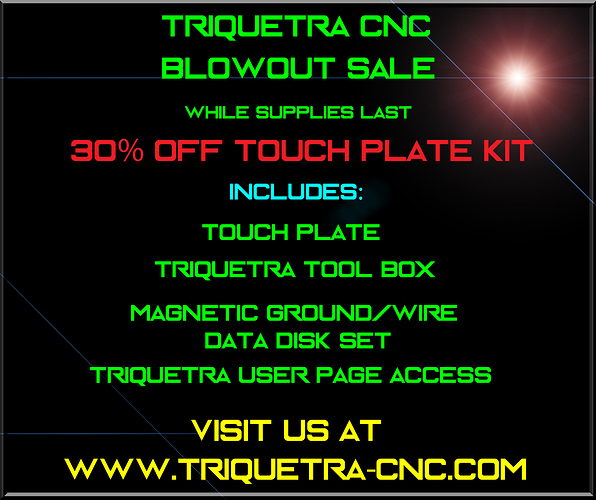 Starting Today, You can get your very own Triquetra 3 axis Auto Zero Touch Plate Kit for 30% off the normal price. The kit includes everything you need. You get 1 Triquetra Touch Plate (New Logo pictured below), 6 feet of 16 gauge wire with a banana plug and magnetic connector already soldered in place, Data Disk set that contains the Triquetra Tool Box and lots of video tutorials and help files, unlimited access to the Triquetra User Page, and a plug for use with the X Controller if you need one. Is the X-controller required for this? No. Not sure which controller you have but this works with the Arduino/gShield. If you have an X-Carve then it will work. I was on the original waiting list when the X-Carve was first released so I received the original controller and never had any problem zeroing all three axis with the Triquetra Touch Plate. To date I have only come across one system that is not compatible and that is not due to the machine but the software. From what I understand, Carbide Motion does not support probing. However, I was also told by one user of Carbide Motion that he switched to Universal G-Code sender and was successful. Virtually any CNC Router that uses an Arduino/GRBL configuration will not have any trouble using the Triquetra Touch Plate.The same is true for any CNC that runs Mach3 as well. The Triquetra Tool Box software that comes with the Triquetra Touch Plate generates the G-Code for Arduino based machines and Script for Mach3 machines. Let's hope Inventables will license/buy/pursuade/take-over you and your touch plate system like they did for that dust shoe contraption. While this does work with the XCarve, it doesn't work in Easel.....and that's such a shame! It wouldn't/shouldn't be too difficult to add this capability to Easel. In place of Z-probing, they could 3-axis align/z-probe instead or in addition to. But, like many enhancement requests I've seen on these forums, the suggestion would probably be ignored. In all fairness to Inventables I did exchange emails with @Zach_Kaplan several months ago. I provided him with a g-code example that works with the Triquetra Touch Plate. I was asking him if it would be possible to modify the g-code spec for Easel to allow my code to be imported. Currently the g-code spec for Easel does not allow G38.2 and G92 commands to be imported. Those two are essential for zeroing. He told me that it wasn't as simple as that and that they have to be very cautious because even the most minor changes can have a butterfly effect that can be bad. Since that time they have added Z axis probing to Easel. Perhaps they are not using G92 or G38.2 commands and have figured out a different way. I honestly couldn't tell you. Should Inventables want me to get out of the Touch Plate business then I would of course be open to a dialogue. Just to be clear, if you have an X Carve that is stock from Inventables then it IS compatible with both the X Controller and the Original Controller. It is also compatible with Mach3. Thanks @CharleyThomas. I have the original x-carve controller, I will give your touch plate a shot, you'll see my order soon. There is still a way to zero all three axis and still use Easel. There may also be a 2nd workaround - Use Easel Machine Inspector and manually copy/paste the relevant G38.2 / G92 code there. I have tested this with Z-zero and worked just fine for me. When I do the 3-axis thing in UGS, then click the 'Return to Zero' button. The Z axis lowers until the bit is actually BELOW the top surface of the material and then moves to X/Y zeros as it calculated it using the touch plate. It then drags the bit across the surface on the way to X/Y zero. Arg!! Why would it lower it further than necessary? Before you ask, YES I have measured my touch plate thickness with calipers multiple times and ensured the numbers are in the script properly. Can you provide the steps you used for this inside Easel? To benefit from 3 axis zeroing and still use Easel requires the use of a different G-Code Sender such as Universal G-Code Sender (UGS) or PicSender. Others will work as well. Carbide Motion will not work. Step 2. Load UGS, or other program and establish a connection to your CNC Machine. Step 3. Load the appropriate Zeroing G-Code file. Step 4. Place the touch plate on your material and connect the alligator clip/magnet to your bit/collet. Step 5. Jog you machine so that the bit is within ½ inch of the right side of the touch plate. Then jog it so it is within ½ inch of the back corner and still ½ inch from the left side. Step 6. Click on Send/Run or which ever button is appropriate for the software you are using to start the zeroing process. When zeroing is completed, remove the touch plate and alligator clip/magnet. Step 7a. If using UGS type the following g-code commands into the available macro slots. They will be saved when you reload the program in the future so you should only have to enter these once. Step 7b. If using UGS, click on the Macro buttons with the code above already typed in Step 7. This will position your bit to X Y Z Zero. Step 7c. If you are using PicSender then click on the GOTO Zero button for each axis starting with either the X or Y first and ending with the Z. Step 8. With your bit positioned at the newly set zero point, Close UGS/PicSender so that they are not longer connected to your machine. Step 10. When asked to position your bit at X Y Z Zero, simply confirm that it is already there. Step 11. Continue with Easel as you normally do. Note, If you change bits while running the same file in Easel then you should only have to re-zero the Z axis as the X and Y should be unaffected. You can use the Triquetra Touch plate to set the Z axis in Easel. Just be sure to place it on an un-carved portion of your material. You can also turn the touch plate upside down and zero to the milled out portion of the touch plate. It is best if you do this to zero to the same are of the plate that you zero’d to on the top side, just on the bottom now. 9 days in to this sale and the response has been very positive. So much so that I am in the shop again today building up a new supply. 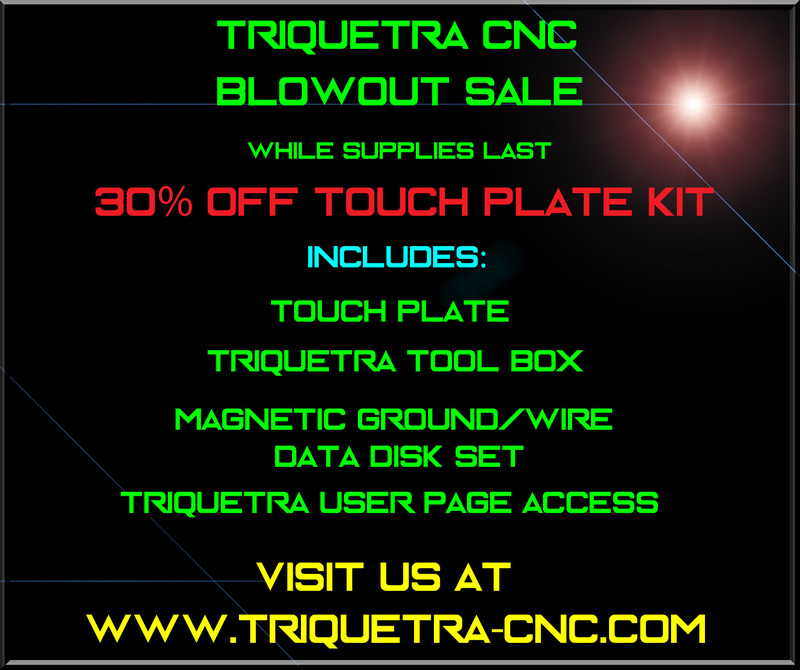 If you have been thinking about getting a Triquetra Auto Zero Touch plate now is the time!! At 30% off on the entire kit with shipping, you will spend less money than you would for the touch plate without accessories or even shipping. Still not sure, read through the forums and see what the current Triquetra Touch Plate owners are saying. Unless I have missed something, all the comments are 100% positive. This sale is for a complete kit. For Auto-Zeroing all three Axis there is nothing left for you to buy. You get it all!! The Triquetra Touch Plate system is compatible with Arduino/GRBL machines like the X Carve and Shapeoko. as well as those that run Mach3. So gete'm while there hot!! I have been trying to contact @CharleyThomas via his web page about questions over the last month and have not got any reply …Does anyone have another way to contact @CharleyThomas ? That’s odd because Charley is great at getting back to peoples questions. Maybe he is soaking up the the sun somewhere on a nice vacation? You can email me at charleyntexas@gmail.com. I apologize to everyone for missing your emails. I promise. I do not ignore emails! !